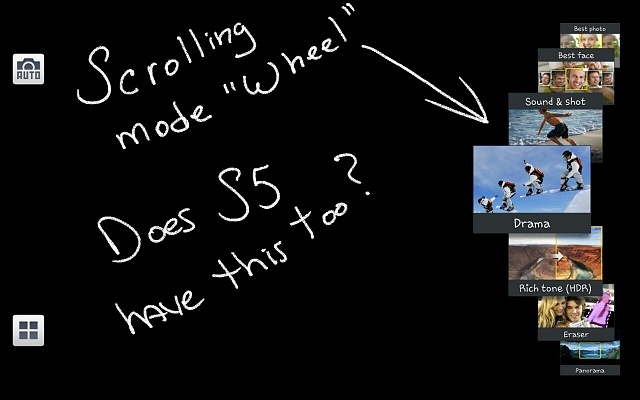 "Scrolling Wheel" Camera Mode on the S5? I was so certain that my S5 had the same type scrolling wheel in the camaera app for the Mode options but then a few days ago the individual modes were just in a straight line. I can't figure out how to get the "wheel" back (provided it was ever there <lol>) Sometimes I get a little mixed up what's on my GN/2014 and what's on the S5. I'm just all but positive the S5 has the same wheel. What happened to it, I have no idea The 4 boxes in the lower left corner toggle the mode options to a basic straight line arrangement (like what I have now on the S5). From where you took the picture? I think, this option isn't available in our S5. Then I think, there is no mod available like this for our S5. while the fonts so small on this tablet? Getting the one m8 back to standard android?